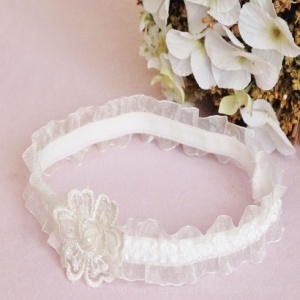 Beautiful baby girls ivory organza headband, perfect as a christening headband, at a wedding for a baby bridesmaid / flower girl or simply for a special occasion including parties. This beautiful soft ivory headband is made up of frilly organza, satin trim and elasticated lycra and has a lovely satin sequinned flower to the front. Measuring 2.5cm in height, head circumference 38cm up to 44cm stretched. I was so so pleased with this head band, the fit was perfect as I've always struggled to find a nice fitting head band for my 4 month old. She wore it to a wedding an got so many compliments. I would highly recommend it. Really love this website also bought some shoes for her from here which were lovely. Defo will be buying more from here. Beautiful headband at a very reasonable price. Received quickly. Our 10 month old will be wearing it for her christening.